Now please listen to me you impatient impatiens plant! You cannot go outside yet! You crane and strain toward the light coming from the patio door in my studio. I'm telling you now, it would be a mistake to step outside! It's northern WI and the temps are still hovering around 40 degrees in the daytime and 28 at night. A few snowflakes were visible today when I took my Mom to an appointment and shopping. 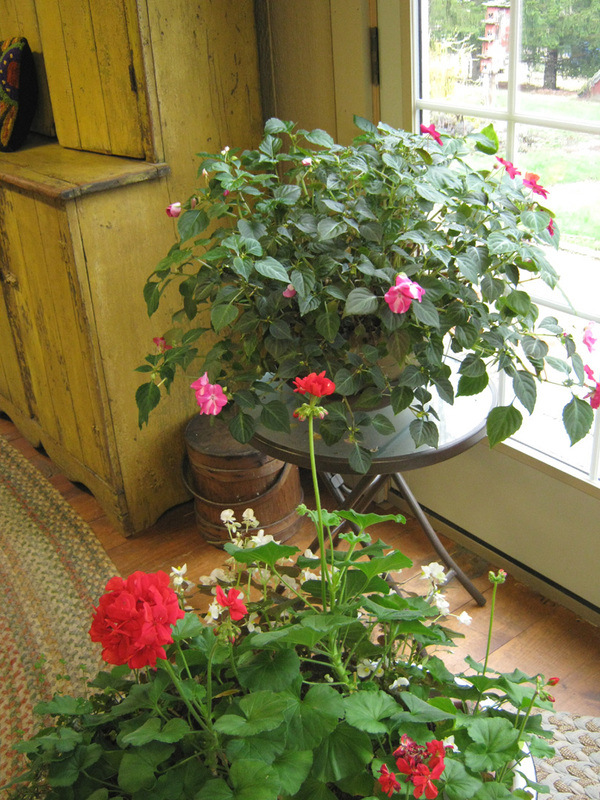 I've kept the impatiens, a geranium and begonia plant from last summer's garden alive all winter to have some green in my studio. As you can see they are thriving and growing like crazy! I've cut them back a few times and still they flourish with only a watering with Miracle Gro a time or two. I'm getting impatient and over flowing my own pot right along with the geraniums to spend more time outdoors with more spring like temps! Patience patience patience! Yesterday was quite an afternoon around here. I had planned to update my blog and upload some photos and as luck would have it our old computer monitor went black never to regain consciousness. Not so lucky as Mr. LG Refrigerator! After an emergency journey to the computer shop which is an hour away, the old monitor was officially declared dead. Sad to say I am rather happy to see it go. About 5 years ago we purchased it used for 25.00 thinking it would last for a year or so. We got lucky. Here he is waiting for Dave to carry him to the car. While I followed behind with all the cords etc. dangling Dave exclaimed " this sucker is really heavy!" Well, the new thin screen we are now using on loan until our new one comes was much easier to carry in!The new one is a flat screen but not huge. The whole episode lasted not more than 3 or 4 hours from the old monitor dying to the hooking up of the loaner. I almost hate to admit this...... but I sort of went into a panic attack. I felt very lost, disconnected, lonely, uninformed, anxious, sad, mad at myself, upset, crazy, to name a few emotions that surfaced while the computer world and I were separated. My goodness, I was trying to dye wool and the wool didn't even turn out the way it should have! I just plain ol' freaked out at not having my puter there at my finger tips. Honestly..... I am ashamed. I didn't realize how dependent I've become and how much not having access to the internet would affect me! Now I ask is this normal? Should I seek counsel? Then who am I asking...... if you are reading this then rest assured you are probably in the same predicament. I could have lived longer without the refrigerator!! But unhook me for a few hours from the world wide web and you may as well call the white coats to come and get me! 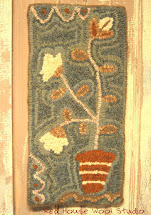 Prepared another pattern on linen. It was really rather fun creating my first kit! Maybe if I had a different cutter I would consider making some of these to sell. Or maybe I need to just go ahead and make some to sell and then use the money for a new cutter! I'm off to watch Jamie Oliver's Food Revolution while sewing on the binding. 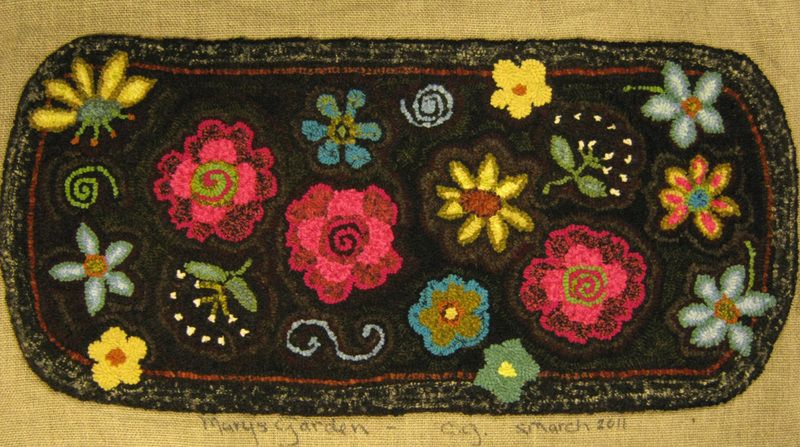 The hooking is now complete on Mary's Garden Rug! She had a sneak peek of it the other day and from what I can tell she is delighted. 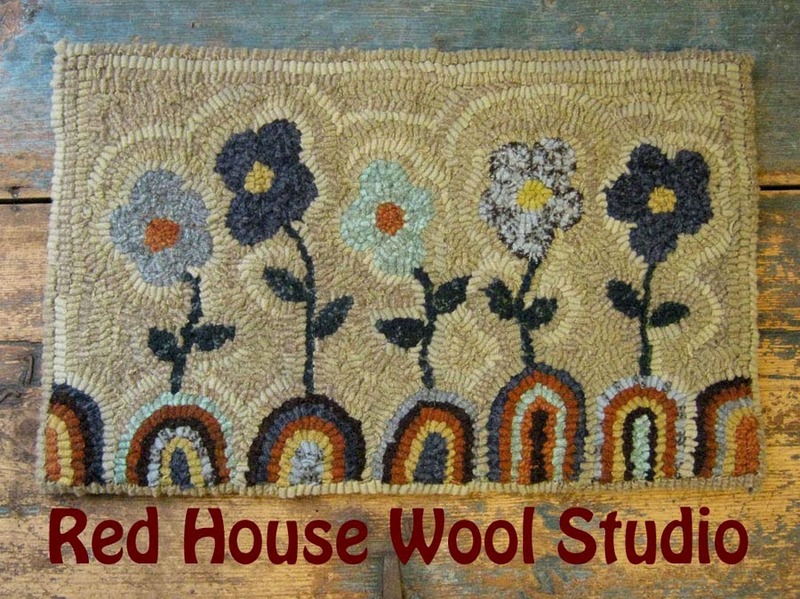 The bold colors and happy dance of flowers across the rug are right up her alley! 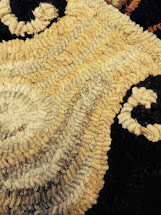 I will be binding it this week by using a twill tape that I hand sew around the edges. But first things first! 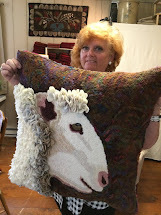 One of my students from my rug hooking class is completing her second project and wants to do another kit. Soooooo.... 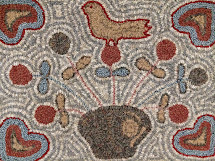 I have decided it's about time I design a rug hooking kit for the student who wants something a little more challenging than a small trivet. It needs to be simple yet a little more challenging and interesting. So hopefully by Wed. I will have something done! Whew! I wanted to let you know how the refrigerator drama panned out. Well, repairman Daniel and his assistant ( a repairman in training) came last friday and installed the part. Mr. LG is humming along in happiness. I'm happy, he's happy, the checkbook sort of happy. The final bill was $178.00. And we have the added satisfaction of knowing Mr. LG served in the training of a new repairman. It's a comforting thought that there will be another good refrigerator repairmen in the world and that Mr. LG could contribute by letting him work on his relay and overload parts. I'm off to the studio and hopefully will have something to report in a couple of days. Oh, just as an afterthought... since weather is sometimes of interest when it's being naughty or nice..... our forecasters are predicting possible 6 inches of s-n-o-w ( we don't say it out loud here anymore)...on Wed. It seems I was a bit hasty in pronouncing Mr. LG Refrigerator dead this morning! I wrote his obit. before the repairman had paid us a visit. Good news! There is life after death for refrigerators and he may not be destined for the happy recycling center for deceased appliances after all! After hooking up some fancy testing equipment the repairman discovered the compressor is still functioning and that the problem is a bad starter unit. Mr. LG is not out of the dark however and will remain hooked up to life support ( temporary starter unit) until said part can be shipped in about 5 days! 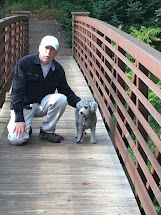 So, I apologize for any undue grief this morning's premature obituary may have caused and appreciate the kind condolences from you dear blog readers throughout the day. We are hoping for a good outcome as a new fridge really isn't in the family budget at this time. Mr. LG is resting comfortably this evening after a thorough scrubbing inside and out today while the food and frozen goods were being stored in Mr. Harvest Gold Fridge in the garage. So keep us in your thoughts and prayers and Courtney please keep that bottle of Pinot Grigio chilled. One way or another we are having a celebration of life by weeks end. For a life that was well lived and stocked with mostly good food and leftovers or a life that will be brought back to us by the life saving efforts of one good repairman named Daniel and a new part! This past Sunday at approx. 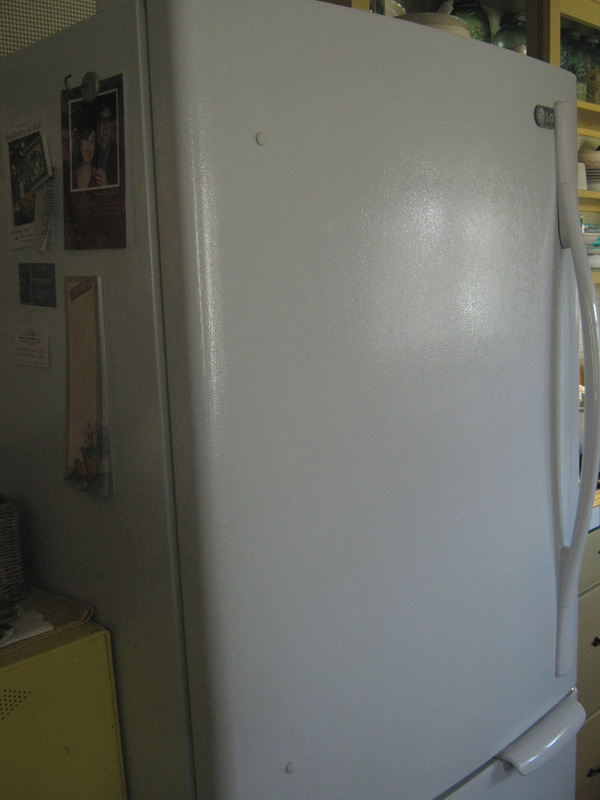 2:30 a.m. Mr. LG Refrigerator passed away peacefully with Mrs. G by his side. He was 7 years of age. He resided with the G's since his purchase on May 5th, 2004 only one month before his warranty on his sealed system(Compressor, Condenser, Evaporator) ran out. Mr. LG made a loud buzzing noise throughout the day but was otherwise unresponsive. The decision was made to pull the plug. He was a trusted and huge white member of the family. 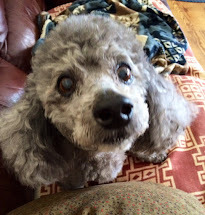 Among his duties of keeping the frozen foods froze and perishable foods chilled he kept the $60 bottle of insulin medicine for the family's diabetic canine Smokey, properly cooled. He was a magnetic personality and proved handy in displaying family photos and grocery lists on his side. He produced many thousands of ice cubes over his short life and had no prior mechanical issues that the family was aware of. Stepping in to cover his duties as of 3:00 a.m. Monday morning is his predecessor Mr. Harvest Gold Refrigerator who has resided(thankfully) in the family's garage since 2004. Harvest Gold has served primarily as a beverage cooler in the garage for Mr. G but has agreed to help out during this family crisis with the sudden loss of Mr. LG. Mr. LG leaves behind family members Mr. and Mrs. G, Smokey and Max the family canines and his constant companion across the kitchen the colorful Mr. Orange Sink. Mr. Orange Sink will miss him terribly and has been weeping small tears from his faucet this morning. Other family members include the elderly Mr. Brown stove top who believes his days are numbered and of course has been around many many years and has seen many refrigerators come and go over his lifetime. Other survivors include a various mix of small appliances including a few crock pots. Arrangements are pending at the Rainbow Home and Appliance Center near the family home. A celebration of life will be held this week and all those wishing to remember Mr. LG will be asked to bring a bottle of chilled wine and non-perishable snacks. Final resting place is yet to be determined. Spring is so slow to arrive here this year! It's been rather painful reading other's blogs who have tender shoots of Spring flowers bursting through the soil already. 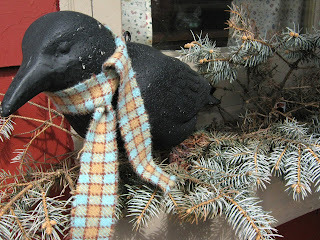 My resident crow in the flower box on the front deck however, is sporting his Spring wool scarf. 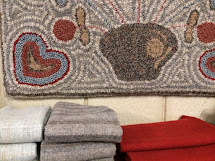 Heaven's to Betsy wool in case you're wondering. I had to show you the progress in the front yard. That's green grass by golly. 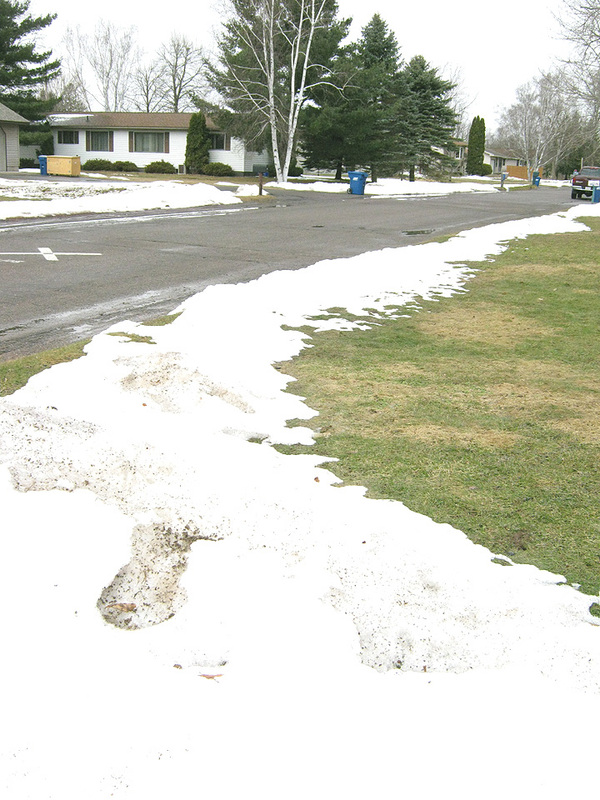 If the cold weather doesn't let up we'll be mowing grass around the snow banks. The ice fisherman in the neighborhood keep us informed about the ice on the lakes. People are still driving on the ice to fish. 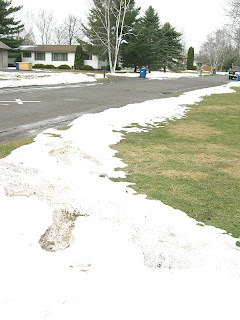 My neighbor Al said yesterday that there is at least two feet of ice on the lakes yet. Since we are in a country where lakes of all sorts and sizes surround us for miles, we know the weather as a rule doesn't warm up until the ice goes out........ hmmmmm. Progressing better than the weather, I had a good afternoon and late night of hooking yesterday. 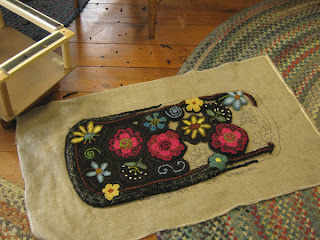 I am digging deeper into my stash for the antique black background wool now. Thought I had dyed enough of a black with a red base wool but didn't end up liking the wool itself. It shredded a little with the number 6 cut I'm using. I switched to a more solid weight wool that has an antique green over dye and it's working better. 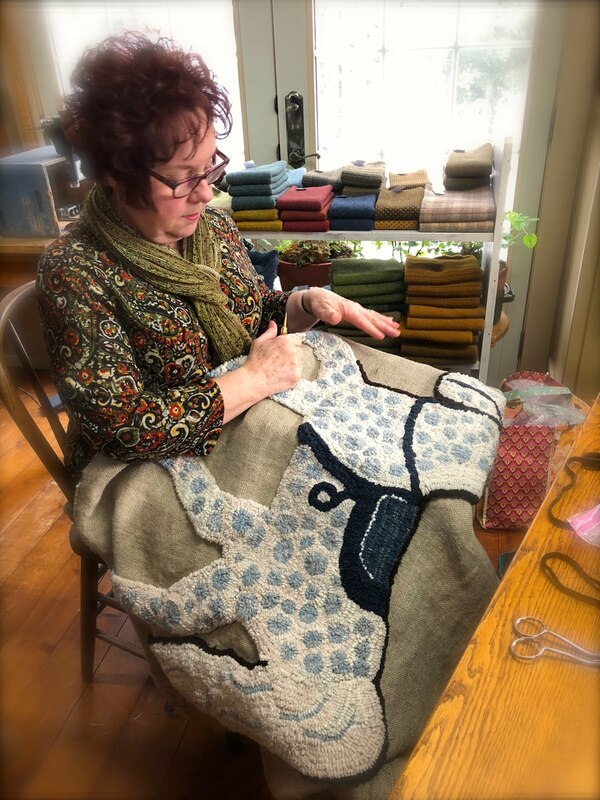 My mind is already transitioning to what my next project will be and I have at least another few days of hooking left on this and then the binding. I am slowing down a little to give my hands a break. 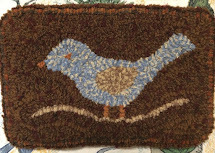 Thank-you everyone for asking about my rug hooking students. 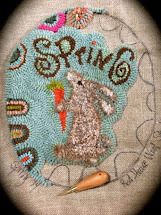 Some have finished their projects and some are hooking more coasters and starting small kits. Two have ordered a nice frame like mine you see in the above photo. They are really excited to get them. We are working on trying to meet regularly here in my studio a couple of evenings a month to hook together. It's taking time for me to organize the next phase in all of this but I can see that almost all of them are hooked on hooking! 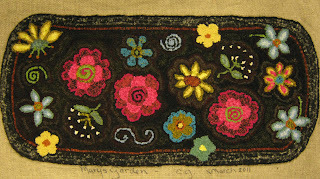 I'm well into this table mat commissioned by my friend Mary. Hooking in a #6 which seemed small after my last project with the hand torn strips! But after hooking awhile it doesn't seem much different than an 8. I guess I'm tricking my own mind! Something which comes in very handy on occasion. 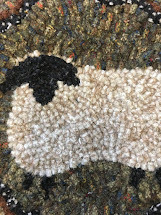 This little mat is designed per Mary's request to fit a small rectangular shaped table with rounded corners in her living room. 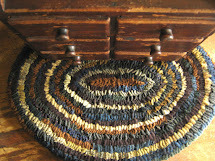 The mat is to cover the entire top of the table. Hopefully my measurements and careful hooking inside the lines of the perimeter will have it fitting her table almost perfectly. It is a nagging thing I keep trying not to think about. ( fitting the table perfectly). The table was tipped upside down and traced onto my paper when I started the design. I actually cut the design out and walked over to Mary's and laid the pattern on the table. A couple of minor adjustments and we have what I hope is going to be the perfect fit. Using the word perfect lightly! How do you like the colors? Mary has been over here visiting my wool stash and was drooling over the hot pink texture in my cabinet. I didn't think at first we'd go with the brightest thing in my stash..... but as time went on and we talked colors and I could sense she was thinking colorful and what she calls "Bohemian colors"was going to be what made her happiest. Then Mary sprung a little divine intervention on the subject which clinched the hot pink texture right out of the cabinet and into her rug! 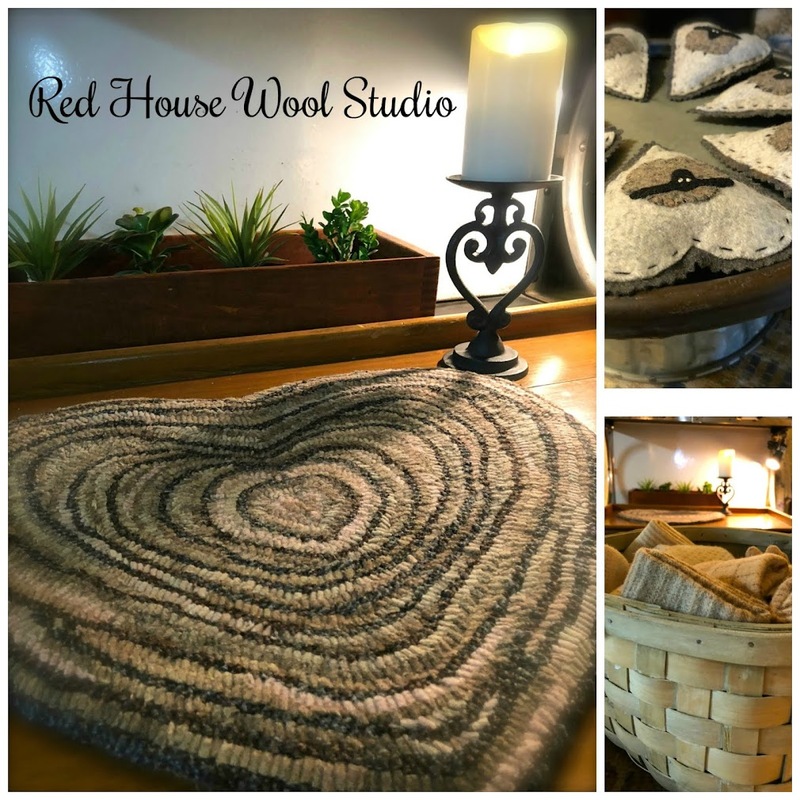 She shyly revealed that God wanted me to know that if I used one of my special wools ( read: one that I have been hoarding for God knows what) in her rug, that every time she walked past the rug knowing what special wool I used she could say a prayer. And God would send special blessings my way. Well, I'm not one to interfere in divine interventions. Truth be told I was saving that special piece of pink for a special rug. 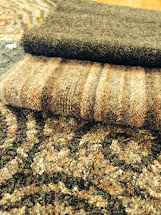 Is this that rug? So far the colors seem to be picking themselves...... or are they? What better way to be hooking with such lovely thoughts in mind. Flowers, friends, color and happiness. Oh and maybe a little prayer that it actually fits the table when it's done!